Our visit to Trinidad coincided (purely by chance) with the national T&T holiday known as Indian Arrival Day, as well as a 20/20 Cricket match between India and the West Indies in Port of Spain, and we were able to experience a bit of both. My son also really enjoyed seeing nesting Leatherback Turtles (in Tobago), as well as various rainforest snakes and birds (Tree boas! Scarlet Ibises!). And we had a superlative experience staying at Pax Guest House for three days in the foothills of the northern range. The conference I attended seemed to be very well-organized, with some snafus here and there –- the keynote by Leela Sarup, for one thing, wasn’t announced on the web version of the program, so I didn’t learn of it until after it had already happened. The quality of the presentations was also a little uneven, with non-academic rants and reflections mixed in with traditional academic papers. Sometimes this led to intriguing chemistry, other times it just made for wasted space. While the conference did describe itself as focused on “Global South Asian Diasporas,” the most interesting discussions really had to do with the Indo-Caribbean diaspora – but of course that’s perfectly fine. Literature. This was not really a literature conference, but there was at least one panel on Naipaul, and I was fortunate to meet two Indo-Caribbean writers, Cyril Dabydeen (who is from Guyana originally, and lives in Canada) and Raymond Ramcharitar (who is from Trinidad and continues to live there), in person. At the Naipaul panel, I enjoyed papers by Nivedita Misra (a recent immigrant to Trinidad from Delhi) and Kevin Baldeosingh. Misra did a helpful survey of Naipaul’s various writings on India, arguing that his Trinidadian / diasporic background remains the central lens through which he sees the “homeland.” And Kevin Baldeosingh helpfully mentioned and quoted from some Indo-Caribbean writers besides Naipaul – including Harold Sunny Ladoo (“Yesterdays”) and Raymond Ramcharitar (“The Island Quintet”). Manny. She did not wear saris no more. To the ethereal ballad of Krishna’s flute. Four hands from round her waist. Rootless Negroes. And so Trinidad became herself. All this was allowable in the name of Ken Gordon’s “press freedom” —which also allowed Indian Review Committee agents (Anil Mahabir, Rajnie Ramlakhan etc) into the daily press to spew Hindu fascist rage and racial contempt for AfroTrinidadians. This was exactly what the Creole world believed all Indians were like, so (in their minds) justified talk radio’s filth. “Indian” talk radio content was a stream of bewildered rage that this was happening in daylight. The PNM still lost the 2000 election, but when they were “let back in” by Ramesh Maharaj and PNM stalwarts ANR Robinson and Abu Bakr, in 2001, they mobilized their police, judicial, and media arms. The media spread the gospel: the UNC (Indians) were all corrupt, evil, and tiefed from “real” Trinidadians. The judiciary and police initiated lengthy, public prosecutions of the Indo Chief Justice, Sat Sharma, the Indo chief doctor, Vijay Naraynsingh, and Indo voter padders (all acquitted). Dance and Music. If race-relations was a bit of a blind spot at this conference, the discussion of music in particular was much more satisfying. A book that seems to have been influential for people doing cultural studies of Indo-Caribbean musical culture is Tejaswini Niranjana’s “Mobilising India” (Duke, 2006). It was cited in both of the papers I saw that dealt with Chutney Soca music. It’s available on Amazon via Kindle ($13) or more for the regular book. Jahaji Music from surabhi sharma on Vimeo. Pichkaree Music. Another presenter gave a very interesting paper on a kind of music called “Pichkaree” music after the tube that is used to spray color at Holi (known as Phagwah in Trinidad). Pichkaree music could be defined as “conscious Chutney” – equivalent perhaps to “conscious” reggae and hip hop in black diaspora music. One major veteran of Pichakaree music, Ravi Ji was actually in the audience. I spoke to him after the panel briefly and asked him where I could find his music: “We didn’t have money to record much of it.” This is sad, though Ravi Ji did assure me that more recent generations of Pichkaree performers have been recording their music. Meanwhile, you can read some columns by Ravi Ji at the TT Guardian if interested. More Music: neo-traditionalism and Tassa. By far the most comprehensive discussion of Indo-Trinidadian music was Peter Manuel’s presentation, which focused more on the evidence of traditional Bhojpuri musical forms in Indo-Trinidadian musical culture than on the newer, hybrid Chutney Soca genre. Manuel pointed out that you can find Trinidadians who still practice very traditional Bhojpuri folk forms, such as “Chautal” and “Birha”. He also had some interesting comments on the style of drumming called Tassa – that is prevalent in Trinidad but not so common in India itself. Manuel seemed to suggest that in Trinidad that Tassa drumming has become something more complex and “virtuosic” than it is anywhere in India. Language. There’s a fair amount of Hindi in Chutney soca music, mostly derived from Hindi film songs, but it seems the vast majority of Indo-Trinidadians have lost access to Bhojpuri or Hindi. Hindi has been introduced in many Trinidadian public schools, but it’s not clear whether that will lead to a substantive increase in the number of functional Hindi speakers in Trinidad. It was curious at first to hear the Pujari at the Mandir at Waterloo doing interpretation in English (in between hymns sung in Hindi). But of course it makes perfect sense – and it probably won’t be long before we start seeing Hindu and Sikh services that resemble this approach in the U.S.
Jhandis. 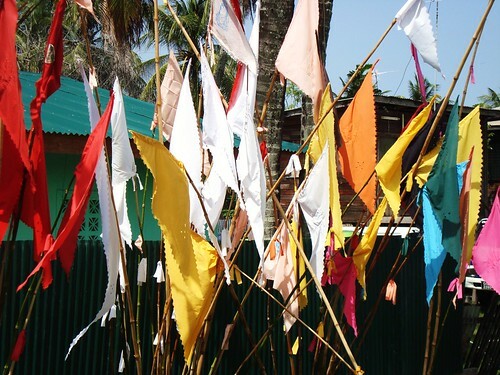 One of the things you notice around Trinidad are the “jhande” – little colored flags. (Trinidadians call them Jhandis.) There is of course a tradition of using Jhande at specifically Hanuman mandirs in India, but in Trinidad (and other parts of the Indo-Caribbean world), the “jhandi “ has become much more widespread than that –- many Hindu households use them to mark their houses at the font gate.